Summary: THAT’S NOT MY DOG is a joyous comedy that celebrates our love of joke telling. The film centers around the lovable Shane Jacobson (playing himself) who is throwing a party. Invited are the funniest people Shane knows comprising of Australia’s biggest stars along with several Australian music legends playing their biggest hits live, right throughout the party. The invite that goes out is clear. Don’t bring meat. We’ll provide the beer. Just come armed with nothing but the funniest jokes you’ve ever heard. Shane will take care of the rest. It’ll be a night of great friends telling the world’s funniest jokes over a beer and BBQ. When it comes to comedy specials things are normally pretty straight forward – it’s either one comedian doing stand-up for the entire special or a producer randomly selects the current ‘it’ comedian to host a special where they simply just stand in front of a camera and ‘introduce’ a myriad of comedians to perform their own stand-up routine. That’s where That’s Not My Dog comes into its own. Aussie comedy great Shane Jacobson (The Bourne Legacy, The Dressmaker) came up with an absolute gem of an idea when he rang his great mate producer/director Dean Murphy (Charlie &Boots, Strange Bedfellows) and said that he wanted to bring back the art of telling a good old-fashioned joke. Of course the creative mind of Jacobson wouldn’t settle for just the plain old comedy special, and in his brilliance he comes up with the wonderful idea of inviting 30 of his funniest mates to come to a BBQ – eat great food, have some brilliant live music played for them while they also stand around telling some of the funniest jokes that you are ever likely to hear. 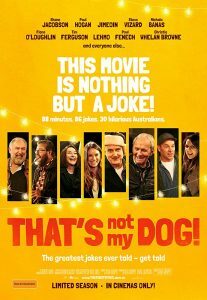 The result is a brilliant film that turns out to be a celebration of Australian comedy like we have never seen before. The audience sits laughing themselves into hysterics as comedy greats like Paul Hogan (Crocodile Dundee, Strange Bedfellows) and Steve Vizard (Full Frontal, The Wrong Girl) join forces with comedians of today, like Jimeon (The Craic, The Extra) and Lehmo (Any Questions For Ben, Utopia) and tell three of the funniest jokes that they know. Then of course there are also the hidden talents of those such as Michaela Banas (Nowhere Boys, Always Greener) who steals the show with not only her jokes but also with her ability to tell them. The concept of the jokes being told at a BBQ just adds to the film with the background noise, and live music being provided by the likes of Dan Kelly, The Black Sorrows and Adam Brand just adding even more atmosphere to the film. What works best though with the film is of course the jokes and luckily for Jacobson his cast came along armed with some of the best jokes that you are ever likely to hear. Aside from Michaela Banas the other star here who really steals the show is the great Marty Fields (Ghost Rider, Blue Heelers) who just delivers comedy gem after comedy gem. 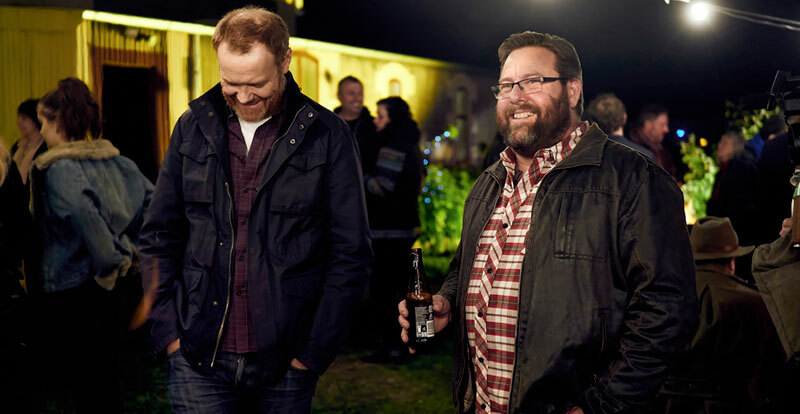 The affable Shane Jacobson (whose previous film The BBQ was a massive disappointment and a laboured and unfunny comedy that failed to fire up) threw a massive party at his father’s property in Clarkeville, in regional Victoria. He invited along thirty of Australia’s top comics to share in the joy of joke telling and laughter. He provided all the meat and beer, all the guests had to provide was their funniest jokes. Guests included Paul Hogan, Jimeoin, Marty Fields, Stephen Hall, Fiona O’Loughlin and Tim Ferguson, amongst many others. The whole night was captured on film by filmmaker Dean Murphy, who directed both Jacobson and Hogan in the road comedy Charlie And Boots. Murphy adopts a free-flowing style here as the camera roams around the party, recording the jokes and the camaraderie. Gags fly thick and fast throughout the relatively brisk 89-minute running time. Each of the guests are given their moment to shine, but some seem to get more screen time than others. Some of the jokes may be familiar, but the veteran comics also put a fresh spin on the gags. And the musical accompaniment to the evening was provided by a bevy of musical acts, including The Black Sorrows, Russell Morris, Adam Brand and Dan Kelly. That’s Not My Dog is like spending an informal evening in the company of these comics as they enjoy each other’s company and eavesdropping on their funny stories in a somewhat relaxed setting. Everyone seemed to be having a ball. Jacobson’s father Ron comes across as a pretty good story teller himself, but his energy seems to be flagging by the end of the night. The whole thing was filmed over one long night, shot by cinematographer Robert Lanser (who shot Murphy’s Charlie And Boots). Then Murphy and his editor Robert Mond patiently worked through the footage to tighten up the material and remove jokes that were repetitious or potentially too crude or offensive. One of the big distractions in the film is the blatant product placement, although this is probably how Jacobson and Murphy gained the funding for this low budget film and extravagant evening. Depending on personal taste though some of the humour will be hit or miss. The title itself comes from the punch line to a classic joke that was used in a Pink Panther movie. For me the highlights were Marty Fields and his stream on clever and witty one-liners and a great joke about a woman joining the CIA. And while a generally entertaining film, That’s Not My Dog is not great cinema. However, it will be best enjoyed in the cinema where audiences can share the experience and the humour with others, as laughter is often infectious. But it will also do well when released on DVD, where you can re-watch and listen to your favourite jokes over again. To listen to some film journalists talk the state of the comedy genre is in tatters. Apparently unfunny comedy after unfunny comedy floods our cinemas screens. The notion is ridiculous though. It seems that films like Horrible Bosses and We’re The Millers have been completely forgotten about… hell even the local comedy Swinging Safari was a lot funnier that most journos gave it credit for. 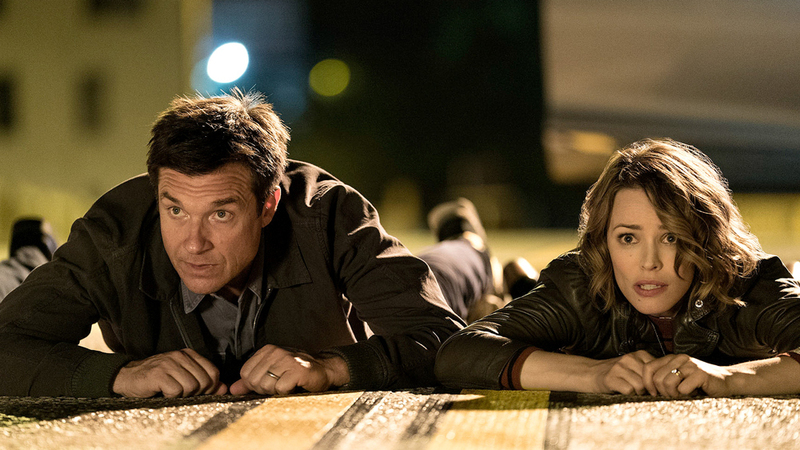 Now comes Game Night a film that certainly shows that comedy is back – not only does the film’s twists and turns keep the audience guessing but it’s sassy comedy and modern edge make a film worthy of more than one viewing. The plot of Game Night is unique in itself. Max (Jason Bateman – Arrested Development, Juno) and Annie (Rachel McAdams – The Notebook, Mean Girls) are a regular couple with a big difference – they are driven by a competitive spirit that makes their frequent games’ nights a must attend for their friends. However their games nights are changed forever when the couple realise that their inability to conceive a child is caused by Max’s competitive streak with his rich and popular brother Brooks (Kyle Chandler – Argo, Manchester By The Sea). With Brooks coming to town and deciding to host the latest games night… a night that he says nobody will forget… Max and Annie are already on edge. To make things worse they are trying to hide the night from their creepy, ex-friend and Police Officer Gary (Jesse Plemons – Battleship, Black Mass) so he doesn’t turn up, but that all pails into insignificance when Brooks’ real life makes the night potentially deadly. Universally panned for their work on Vacation directors John Francis Daley and Jonathan Goldstein bounce back here largely thanks to a witty script written by Mark Perez (Accepted, Herbie: Fully Loaded). While the premise of the film seems basic Perez’s screenplay makes this film stand-out. Game Night has everything that a good comedy should have – witty one-liners plus memorable characters like the dry and dull Gary and the extremely dumb himbo Ryan (Billy Magnussen – Into The Woods, The Big Short). In fact it is the chances that Game Night makes that ends up letting the film work. The decision to tone the adult humour down when compared to a film like Horrible Bosses means that this becomes the perfect date movie for both men and women while the interesting choice of cast all works. Batman and McAdams gel well as an on-screen couple while Jesse Plemons steals just about every scene he is in with some brilliant deadpan character acting. The other big surprise here is Kyle Chandler. Known more for his gritty dramatic roles in productions like Friday Night Lights Chandler here shows the world his comedic skills as he makes sure Brooks is one of those characters that the audience will love one moment and hate the next. Game Night is one comedy that is well worth a look. Its great screenplay allows for a little more storyline and suspense then what we expect from most comedy films while Jason Bateman once again shows why he is the current king of comedy. As you sit down to watch Game Night be prepared for a wild ride with more than enough laughs to keep the comedy fans happy as well. 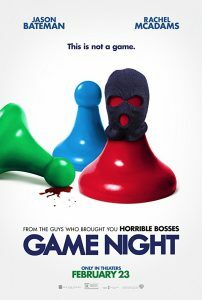 This enjoyable mix of action and comedy from the team behind films like Horrible Bosses is like David Fincher’s The Game crossed with Date Night. A group of friends regularly meet every Saturday night for some old-fashioned fun, playing old school board games and charades. The games are held at the home of Max (Jason Bateman) and his wife Annie (Rachel McAdams), both very competitive gamers who met a trivia night. The players include bickering high school sweethearts Kevin (Lomorne Morris) and Michelle (Kylie Bunbury) and dim-witted ladies’ man Ryan (Billy Magnussen, from tv series Get Shorty, etc), who brings along a different shallow empty-headed date each night. But this time, Max’s supposedly much more successful and wealthy older brother Brooks (Kyle Chandler, Emmy winner from Saturday Night Lights, etc) arrives for a surprise visit and decides to up the ante when he hosts his own game night. He has chosen an interactive “mystery” theme around the concept of a kidnapping. But things quickly go pear shaped when real life crooks invade the house, beat up Brooks, duct tape and drag him from the house. Max and the gang initially think it was all part of the game. But when they realise that it was real, Max and his friends embark on a cross town chase to try and rescue Brooks. Their competitive spirit though means that they try to race each other to find Brooks and their efforts are driven by their natural one-upmanship. They soon discover that neither the game nor Brooks are what they seem. The chase also sees them having to find a Faberge egg, which is something of a McGuffin. For the most part Game Night is an energetic and light-hearted action comedy with thriller elements as it mixes some car chases, fight scenes and the odd angry shot. But the plot is also very convoluted and there are a couple of last minute twists that defy credibility. The script comes from Mark Perez (the more family friendly Disney film Herbie Fully Loaded, etc). The film has been directed by John Francis Daley and Jonathan Goldstein, who are best known for writing comedies like Horrible Bosses, etc. They made their feature film directorial debut with 2015’s disappointing Vacation reboot, and here they bring their own comic sensibilities to Perez’s screenplay and make the most of the thin premise. The film is slickly paced, and cinematographer Barry Peterson suffuses the material with a noir like palette. There are some nice visual gags as well, including establishing shots of various neighbourhoods that initially resemble a board game community. Bateman often has a nice everyman quality that shapes his performances. Here he seems far more comfortable than in some of the crass comedies like Office Christmas Party that he has appeared in. He and McAdams develop a wonderful chemistry that lifts the film, and they play off each other well. It seems that she has allowed Bateman to lift his game. McAdams also shows a nice flair for comedy. The cast also features Jeffrey Wright (Casino Royale, etc), and Danny Huston and Dexter star Michael C Hall in small roles as shady underworld figures. Everyone in the cast is given their own moment to shine. But the stand out of the ensemble is Jesse Plemons (American Made, etc) who plays Gary, Max and Annie’s somewhat creepy and obsessive neighbour. Gary used to be a regular part of their game night crowd until he and his wife Debbie divorced, and he became too moody and depressed for their liking. Game Night is uneven, but with a brisk running time of 100 minutes it never quite outstays its welcome. And it is a lot more fun than many other recent Hollywood comedies. The amiable if at times flat Game Night is a little like David Fincher’s The Game done in the style of contemporary comedies like Horrible Bosses. It also falls into that cinematic sub-genre the Jason Bateman movie in which Bateman plays the put-upon, every-man, nice guy schlub forced into a dangerous situation that inevitably provides some necessary jolt to his staid suburban life. Here Bateman plays Max who, despite a comfortable life and marriage to the gorgeous Annie (Rachel McAdams), is perpetually stressed, a condition that seems to be impeding his ability to conceive a child. The source of his anxiety seems to be his arrogant Wall Street trader brother Brooks (Kyle Chandler) who has always taken sadistic delight in trouncing Max at games and competitions throughout their lives. When the obnoxious Brooks invites Max and Annie and their friends to a murder mystery party the night unexpectedly turns into a battle against kidnappers and sleaze-ball gangsters. The film attempts to weld a typical Bateman middle class suburban rom-com to a crime thriller but the results are at best middling. Bateman’s easy charm and comic timing work about as well as they do in other films where he’s played essentially the same character and McAdams’ cheery, live-wire performance is typically fun and endearing. Add an amusingly creepy performance from Jesse Plemons as a weird, angry cop neighbour who’s determined to inveigle himself into Max and Annie’s life and at least in its early stages, this is an enjoyably perky comedy. As the film attempts to entangle Max and Annie in a twist-laden action/crime/ caper/ story, though, it begins to lose its appeal. The film lacks the necessary thrills, intensity and drama for this part of the movie to work. Add to this a few dud gags, predictable story threads, sub-plots about characters misfiring relationships that don’t really go anywhere and some completely unbelievable scenarios including a ludicrous sequence at a gangster’s mansion and Game Night becomes a little laboured. 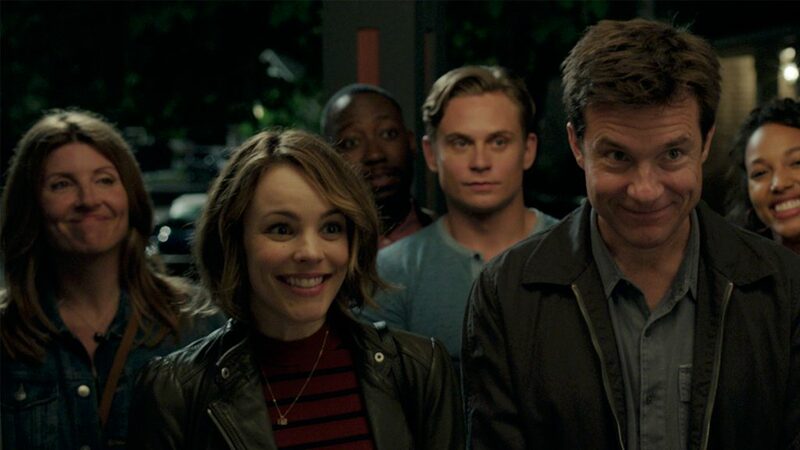 Thankfully, Game Night eschews much some of the grubbiness and nastiness of contemporary raunch comedies but it doesn’t replace this with enough genuine wit, energy or clever story-telling. Adam Ross, Dave Griffiths, Greg King and Nick Gardener are back with the latest episode of The Good The Bad The Ugly Film Show. On this episode of The Good The Bad The Ugly Film Show the boys take a look at the Italian Film Festival and they review Ali’s Wedding, Born In China, Girl’s Trip, God’s Own Country, It, Kingsman: The Golden Circle, Logan Lucky, Maudie, The King’s Choice, The Lego Ninjago Movie and The Lost City Of Z. Actress Rhiannon Fish also stops by for a chat about The 100. This week on The Good The Bad The Ugly Film Show Adam, Dave, Greg and Nick take a look at new release films ‘Power Rangers,’ ‘The Boss Baby,’ ‘Life,’ ‘The Space Between Us,’ ‘Beauty And The Beast,’ and ‘The Search For Life In Space’. This episode also contains interviews with Alec Baldwin, Tobey Maguire, Asa Butterfield, Emma Watson, Dan Stevens, Eric England (Get The Girl) and Anna Bourozikas (Setting Sun Short Film Festival).